It’s time to let your heart speak. The historical Italian Design Factory Alessi invites all creative talents to rethink the product as an act of love. The aim is to interpret the love token in a contemporary way, designing a new object that celebrates this universal feeling: the best proposals will grant you the access to an international workshop for the development of the new Alessi collection. continuously researches new languages and creative ways, such as in the collaboration with Desall, experimenting a new approach through the web. The metaproject is directed to find new ways of considering the love gift, related to the celebration of significant moments or the expression of your own feelings. Therefore the starting point is the man and no longer the object, meant as a product. The focus is on the creation of emotional objects, overcoming the industrial and anonymous production logic. For this reason, a good tip to start with is considering all the unforgettable events linked to the universal feeling of love: not only those towards the partner but also the fondness for a friend or the respect for a colleague. Now it’s your turn to translate feelings into reality, coming up with small objects designed to be given. Last but not least pay attention that love is an universal feeling, but how people express it is personal and may change over time. A letter or a jewel are only examples of ways to express this unique and deep feeling. Technological sources: deep-drawing, investment casting, punching, embossing, laser cutting, sandblasting. The selection of the winner of Alessi in Love will be the result of an unquestionable evaluation of a selected jury headed by Alberto Alessi. It will take into account originality, feasibility and consistency to the brief. The best proposals will grant access to the international workshop, where designers will cooperate with a qualified team for the development of the new Alessi collection. Once the workshop is over, if the project developed becomes an Alessi product, Alessi itself will manage the contractual relationship with the designer for the provision of royalties. Given the great response that the contest is receiving from the international audience, Alessi has decided to increase the prize with 3 more workshop accesses, reaching a total of 8 special admissions to the exclusive workshop by Laura Polinoro - LPWK to be held at the end of January 2014. To let you all join the contest, the deadline for submission has been moved forward to December 3rd. Please check the updated dates in the brief available for download. UPDATE 1: Once the workshop is over, if the project developed becomes an Alessi product, Alessi itself will manage the contractual relationship with the designer for the provision of royalties. UPDATE 2: Alessi has decided to open the contest to ceramic and silicon. Now you can work with: steel, aluminium, plastic, blown glass, ceramic and silicon. 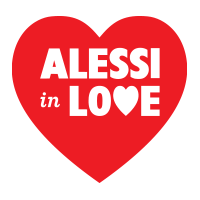 Do you want to stay updated about "Alessi In Love - Every time an act of love"?